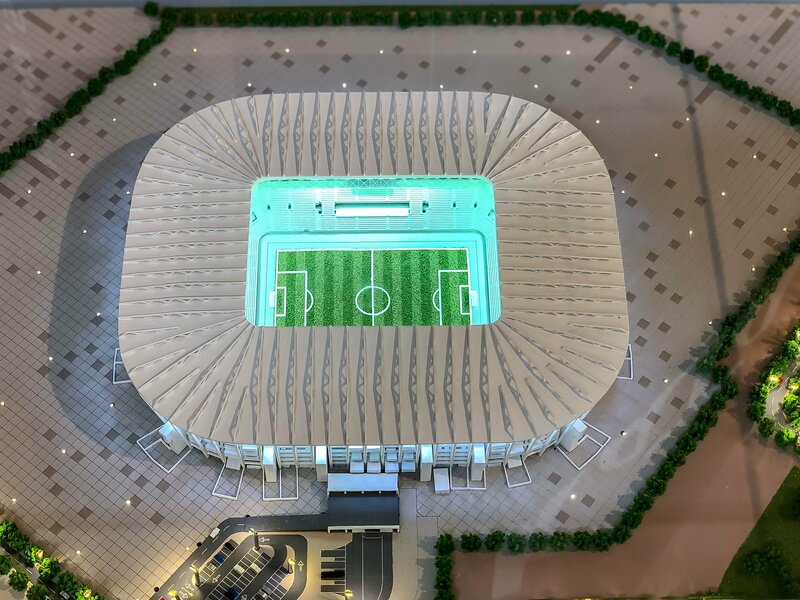 While controversy has plagued Qatar since becoming hosts of the 2022 FIFA Football World Cup, the story of more interest to us is how the nation is building a ‘green’ stadium that can be entirely dismantled and repurposed after the tournament. The 40,000 capacity Ras Abu Aboud Stadium, located in Doha with views over the waterfront promenade and West Bay area, is one of eight host venues for the Cup. It will be the first ever demountable stadium made out of shipping containers. The stadium is being built in phases over 450,000 square metres and will feature seven storeys made from 990 modular containers. It is on track for being completed in 2020 – two years before it will be a stage for football’s world greats. The same containers delivering materials to Doha will become part of the stadium’s structure, with all elements including ceiling panels, grandstands, and bathrooms, being easily segregated and transported. The initial construction phase consists of mounting steel framework, then the containers will be placed together just like building blocks. Once everything is in position, painting, and finishing touches such as removable seats and concession stands will see the structure come to light, resembling something similar to a modern hotel. Since the pre-fabricated structure uses fewer materials, it will not only save up to three years of construction time, but it will also reduce waste and emissions. A four-star Global Sustainability Assessment System certification is expected to be awarded to the project, which is a Gulf Cooperation Council ‘green building’ rating system. What will happen after the World Cup? After the World Cup is over in 2022, the containers and materials used to build the Ras Abu Aboud Stadium will be dismantled and redistributed for other sporting venues in Qatar. The land that it is built on will be turned into a public park and retail space. Also, 170,000 demountable seats used for the tournament across various stadiums will be donated by Qatar to countries in need of sporting infrastructure. As recyclers of shipping containers ourselves, we believe the container stadium concept could potentially change the future for countries hosting events such as the World Cup, the Olympic Games or the Commonwealth Games. Rather than spending millions on new stadiums that put a strain on our time and resources, demountable stadiums could be repurposed and passed on from city to city. This will no doubt be an innovation to watch and will certainly catch the eye of nations wishing to host major sporting events in the future. To find out more about how we can help your project become more sustainable, get in touch with us today!